Wish You Were Here! – Hey, Look! A Writer Fellow! I’m going on vacation this week! Unfortunately, that means that I have shut down my computer for the duration. 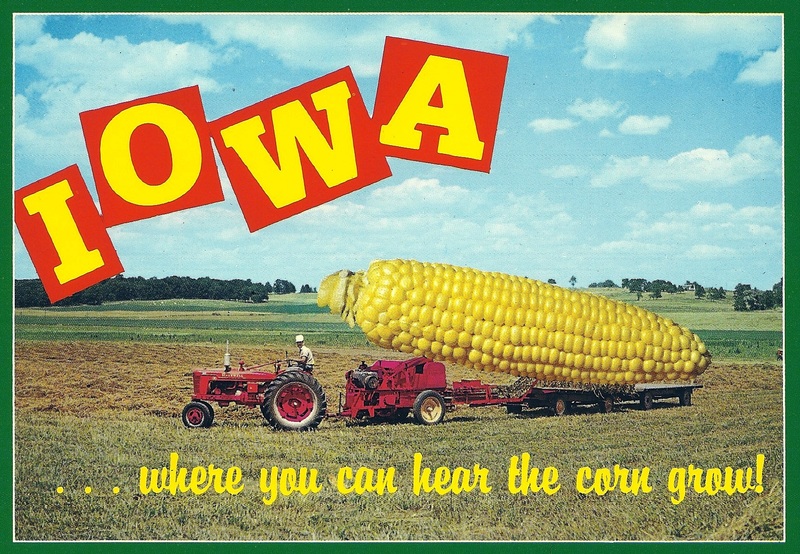 No, I’m not vacationing in Iowa, but years ago I visited there long enough to buy this snappy postcard. In all seriousness, Iowa is a really nice place. In fact, I would live in Iowa if it was only located near anything. Anything at all. Work on that, Iowa, won’t you? Just get near something and I’m all yours! While I’m gone, please do check out some of my old posts. I’ve always kinda liked this one. 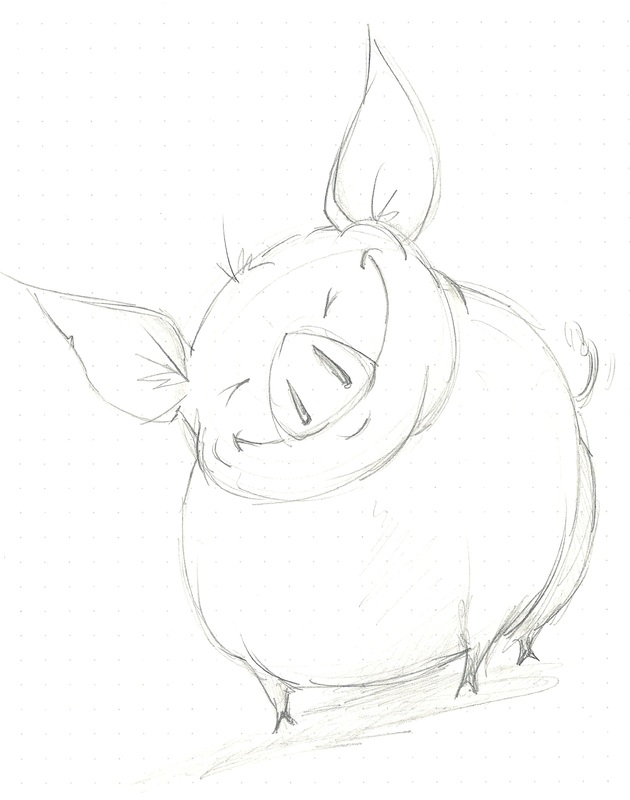 And – just because – please enjoy my drawing of a happy pig. This sketch is brought to you courtesy of the long lines at the DMV. Do feel free to leave me a comment, by the way. I do so love those. I will answer every one of them upon my return. And here’s a prompt: What is your favorite wild animal and why? 6/22: I’m back! And how nice it is to come home to so many likes and comments! It is truly a Sally Field moment. I’ll write up a new post soon. Favorite wild animal you say? I love sheep! Yep, wild…sheep. I know there must be sheep in the wild, but the term “wild sheep” gives me a mental image of a fanged, wooly beast. The next time I’m forced to wait in a DMV-like line, I’ll draw you a picture! Happy Vacation! That pig looks happier than any I’ve ever seen. And I’ve seen quite a few. Perhaps it lost its mind at the DMV. Your comment begs the question: Under what circumstances have you seen “quite a few” pigs? Dahlink, I grew up on a farm in the Midwest. We raised cows, sheep, and chickens. My cousins who lived on the next farm to the west cornered the market on hogs. One could always tell which way the wind was blowing, if you catch my drift. And I even participated in “hog part processing,” a task that involved hanging large cauldrons over a fire. This was before the advent of factory hog farming. On our farm, we named the animals when they were born, cared for them like kids, and sent them to hog heaven with tears in our eyes–unless it was a mean sheepbuck who nearly killed my father. We couldn’t wait to send that sucker to the stockyards. We raised mostly Black Angus (yes, grass fed before it was chic), but one of our calves (a white Charolais) was born on the night of the first moon walk. We named him Apollo. You get the idea. I was hoping for a farm story! Where were you raised? Not Iowa, was it? I very much enjoyed your butter cow post (and recommend it to anyone reading this thread). Rabbits. They’re cute. What can I say? I love the bunnehs! Ellen plants a lot of flowers in our yard and, much to her dismay, they attract scores of the hungry little buggers. This suits me just fine. In my view, a bunneh is far more wonderful to look at than a daisy. Love the happy pig, Mike! Did he just eat the giant corn? Many thanks, David. Coming from a talent such as yourself, that means a lot! If you aren’t going to Iowa, where are you vacationing? Missouri? My go-to-vacation locale is Lancaster County, Pennsylvania. I just love hangin’ with the Mennonites and scarfing Whoopie Pies (aka: Devil Dogs on Human Growth Hormone). Ha! Love that smiley pig! Pig looks great! Enjoy your vacation, where did you go? River otter. Hope you get more inspiration on your trip. DMV worked well enough! Love otters. I take it you are familiar with the viral video of the two otters holding hands? Thanks, Roxie! I am newly refreshed and inspired (and weighed down with German noodles). BTW: Whenever you’d like to set up our online chat, I am at your disposal. super…I’ll email you questions ahead of time…stll out of town, aren’t you on vacation??? Nope, I’m back. Take care! Your pig brings to mind my favorite movie pig, Babe, even though 48 were needed to play him. Hm, I wonder how many of them played their final role as bacon? As a New Yorker, I’ve had a long love/hate relationship with the the pigeon, especially the one that dropped it’s load on the head of a woman I saw that was rude to a homeless guy that tried to bum a cigarette off of her. I’d share a bagel with that doity boid any day — while wearing a hat. I own both Babes on DVD. The first one is about as close to perfect as a movie can get. Gene Siskel was right; Babe deserved that Best Picture statue. When I worked for a newspaper, I even got to write a story about a woman who fought the township council to keep her two pet pigs on her property. I know I was supposed to be objective and all, but I was unapologetically Pro-Pig. That newspaper story (it was a series of stories, actually) was insanely popular. Ah, so you did have Babe somewhere on your brain when you drew your sketch! I wonder what became of that woman’s two pet pigs? They must be the size of boxcars by now. In response to this bureaucratic pig-headedness, she would regularly storm into council meetings wielding a new affidavit from some expert or other asserting that potbellies are pets, not farm animals. She got testimonials from the head of the U.S. Department of Agriculture, The American Pork Producers Council, and a bunch of others. She even crashed a council meeting brandishing the label from her pig feed bag, which stated it was “for pet pigs.” That woman was a reporter’s dream. Bill Bryson is one of may favourite authors. He write on a variety of topics (with some great travel books) but a terrific one is “The Life and the Times of the Thunderbolt Kid’ which chronicles his early life growing up in Des Moines … Really entertaining! I love Bill Bryson and have “Thunderbolt Kid,” “A Walk in the Woods,” and “In a Sunburned Country” on my bookshelf. Believe it or not “Thunderbolt” is my go-to book for a quick laugh. I defy anyone to read about Milton Milton’s dad on the high dive without doing a spit take. I have all his books except ‘Made in America’. If you get a chance, read ‘The Mother tongue’… I read that long before I knew who Bryson was. He is sometimes criticized for sloppy research, and I have caught him out in a few errors but his look at the English language is really engaging! Thanks for visiting. Don’t be a stranger! Tuning in late to say- cute pig. My favourite wild animal would have to be the platypus, because they are just so improbable. Though I’ve seen them more often in the zoo. I only once caught glimpses of them actually in the wild. I’d driven out to look at a small farm in the middle of nowhere accessible by a Four Wheel Drive Only dirt track (and I drove a two wheel drive). 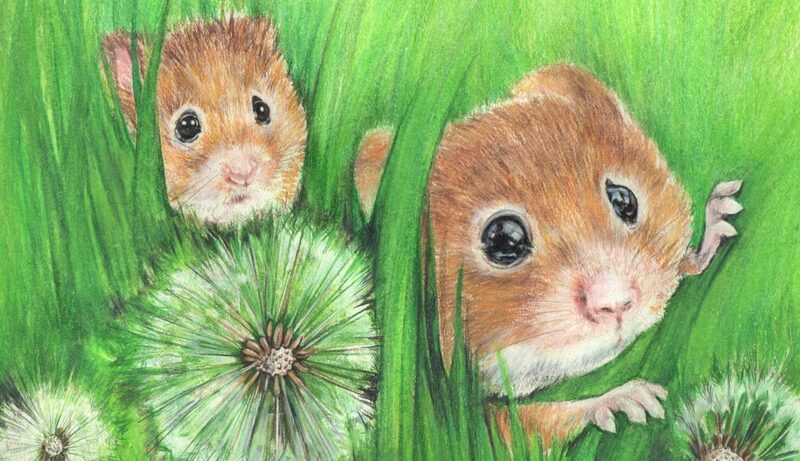 That was back in the days when I wanted to be a hermit and live way out in the sticks all by myself and do nothing but grow vegetables and write. The wondeful thing about this property was the family of platypi who lived in the creek. Rare and amazing creatures. I didn’t buy the farm, by the way. I decided I didn’t want to be quite that much of a hermit. I am jealous. I’ve never seen a platypus in person — not even in a zoo. While I love the idea of a family of ’em hanging around in my backyard, I wouldn’t wan’t to live in such a place, either. That’s a bit too rural for me, to say the least. I love the pig. The DMV has redeemed itself. I am reading this on May Day. How about a turtle in a hat? Hey! Fancy seeing you here loitering around a three-year-old post! To be quite honest, I don’t mind the DMV (or jury duty or waiting rooms) as long as I have a place to sit and doodle. Jury duty and waiting rooms, yes. DMV, no. Everybody is snarky or snarly and then my picture always looks like crap. What’s wrong with Iowa??? Tell me?? I grew up a mile north of the border…..seems like we were always leaning south. I hear there is a reason for that. Very little is wrong with Iowa. If the state moved to one of the coasts, or at least near a significant body of water, there would be nothing wrong with it.